In business it’s often said that time is money and as a CPA affiliate, you alone are responsible for not wasting yours. Time spent on tasks that could be handled more efficiently is gonna cause you to fall behind on work and sooner or later eat into your profit. If not dealt with quickly, what you’re facing is a never ending spiral of playing catch up, and missing important deadlines. Cloud storage is one of the best ways to make sure your work is gonna stay on track. It can free up chunks of valuable time, as well as save a pretty penny on the not-so-insignificant costs you can run up against in your performance marketing gigs. Your main task is to make use of your campaign data in the fastest and smartest possible way in order to make more money. Every moment is precious, but even the awesome Excel cheat sheet we gave you a while ago, can only do so much if your day is blocked by file management issues, lost accesses, or collaboration hurdles across time zones. When you realise how easy it’s gonna be to implement a cloud computing model in the day to day of your business and just how much you’re gonna gain, you’ll kick yourself for not having used one sooner. Perhaps one the best known cloud storage solutions available and one which offers the biggest amount of features for affiliates is Dropbox. They’ve been around for some time and the service is extremely well integrated with just about any operating system or device, giving affiliates a greater degree of flexibility in their work. It’s the perfect choice for performance marketers who tend to employ a fairly agile business model. That being said, we’re about to give you a list of tips that can be applied to any cloud storage solution, so whether you go with Dropbox or not, is pretty much up to you. Different plugins and integrations offered by separate brands may suit your needs better but we’ve found that Dropbox has just the right mix of core features and third-party addons to make it useful in just about any situation. So for example purposes, we’re gonna stick to it. Now let’s get into how is secure cloud storage truly indispensable for affiliate marketers! Forgetting where you saved your mission critical campaign data and spending valuable work hours hunting for creatives can be a huge time sink. Not only is that a sure way to slim down your profit margins, but it also runs the risk of losing your data permanently or at least of not having it at hand when you need it the most. Cloud storage addresses this pain by having a consistent file structure that’s accessible across all your devices. It removes the problem of duplication of data and having unsynced files on the various machines you own. You’re always gonna know exactly where your files are stored and once you’ve set up your file structure, it’s gonna stay that way regardless from which device you access it. As an affiliate marketer, you need to consider your overheads in much the same way as any other business. Cloud storage enables you to scale the amount of data you need as well as benefit from more space for less money. It’s cost effective and many plans come with free tier storage, which are often more than enough for personal use. With Dropbox for individuals, you’ll get 2GB free storage just for registering an account, with a further 1TB of storage available for just $9,99 per month. That’s plenty to keep all your campaign data safely stored for future use and cuts down on additional business expenses such as hard drives and blank media. If you’re in the position that you need to scale your business, you may want to take a look at Dropbox Business for teams, which starts from just $12.50 per month and comes with additional storage space, along with a host of extra features. To meet all of your collaboration needs, you’ve gotta check Dropbox Pro or Dropbox Business. They offer a much richer and fully featured solution for teams. While many performance marketers work alone, there are times you’re gonna need to collaborate. This could be with anyone from your affiliate manager, to freelancers you have hired for a project or designers who need access to project data. Cloud storage’s got some awesome sharing features built in. You can give access to specific folders to your team members and even allow comments and edits on project files. And that’s not all! Through nifty integrations with your favorite CRM suite or project management tools such as Zoho CRM or Slack, it’s easier than ever to collaborate on team projects. This is infinitely preferable to different team members having access to multiple iterations of the same file, which can often be the source of unwanted headaches. If you’ve ever wanted to roll back to a previous version of a file or check who has accessed your data on your team, you’ll appreciate why managing your file version history is so important. With Dropbox it’s possible to preview and review different versions of your files as well as backtrack history on file name changes or when the file has been moved to a different location. This history option is persistent across team members and gives you more control over your data. No more losing creatives through accidental deletion or updates that negatively impact a campaign’s performance. Cloud storage solutions offer automated management of your data, freeing you from the necessity to keep daily backups of important files. This reduces wear and tear on your own drives and saves you money in the long-term. With pay-as-you-go models becoming more popular in the industry, why shell out for expensive hardware that you’re only gonna have to replace in a few short years? Not to mention backups can be a pain to restore and they lack the convenience of a cloud-based solution if you aren’t at your main desk or office. One of the sweetest perks of affiliate gigs is the possibility to work from anywhere. You’re not tied to one specific location, so why should you treat your data any differently and have it all stored in a physical place? Cloud storage gives you the freedom to share and access your information from anywhere in the world around the clock. You’ll have full document control regardless of where your next project takes you and will have access to your files whenever and wherever you need them. You’re also gonna keep local storage costs to a minimum and can choose to pay for equipment that focuses on performance rather than capacity. As a CPA affiliate the last thing you want is for your campaign data to fall into the wrong hands. With cloud storage your campaign data, along with your costs and expenses spreadsheets, are securely stored and protected against hacks and unwanted attention. Plus, if you actually lose your device, you won’t have any downtime on your campaigns. Bookmarks, passwords and campaign links can all be safely stored for future use, so you don’t have to change your logins and you won’t lose access to your priority sites in the event of theft or accidental loss. Affiliates have a need for fast access to secure data. Having multiple file variations on different machines is an accident waiting to ruin your day (Or week. Or month. Or career)..
Plus, it’s adding another degree of complexity in your life that you’d probably rather avoid. Having one central point from which to access all your data wins over having to sync multiple files across numerous devices. It’s like having all your systems contained in one place including your access portals, passwords and open tasks, so you can get on with the task at hand. If there’s one criticism of CPA marketing as a job it’s definitely this: Taking on more roles than you should. While it’s tempting to retain full control over every aspect of the business, knowing when to relinquish that control is the smart play. It’s easy to forget that you don’t need to be responsible for everything, all the time. With cloud storage software updates are taken care of automatically and you’ll experience better integration with the software services that you use. In comparison, setting up your own storage solution requires a lot of technical knowledge and a large commitment of maintenance time. Affiliates often face strict deadlines. Time spent on file management and excessive organisation, or worse – finding integrations that help us to work more efficiently, is time lost. It’s not hard to see how cloud storage makes our lives easier. With deadlines approaching at the speed of light and rapidly changing project files, you’ll wanna have fast access to your data round the clock. The industry is fiercely competitive and making campaign changes on the fly gives you the edge you need to make your traffic convert. 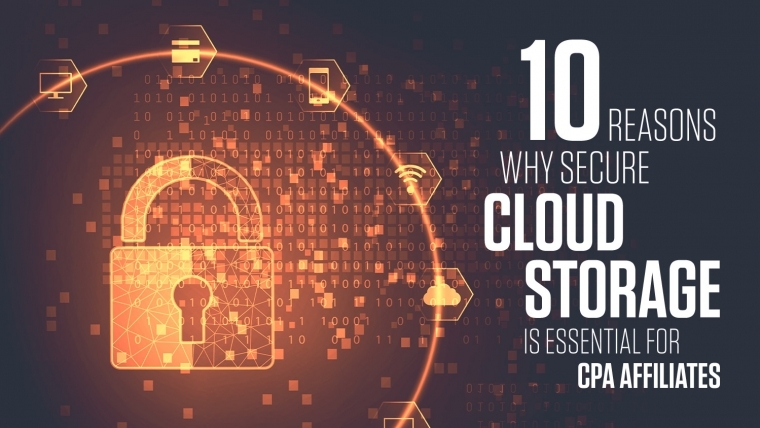 We hope this article gave you 10 solid reasons to consider embracing a cloud storage solution in your affiliate business. Among other things, the benefits include increased productivity, time optimization and cutting back on unnecessary expenses. The time spent on setting up an account and getting used to working this way is far outweighed by the long-term benefits. If you wanna discover even more ways to use Dropbox, check out our article on Secure Cloud Storage and Media Buying, where you can find additional tips on getting the most from your Dropbox account. How has cloud storage helped to streamline your business model? Editor’s note: this is a sponsored post for Dropbox. All opinions are my own. Dropbox is not affiliated with nor endorses any other products or services mentioned.